Chesley Fence & Deck is the deck builder of choice in the Fairview Heights, Illinois, area. Whether you are looking for a place to relax after a long day at work or an outdoor oasis to entertain family and friends on the weekends, our trusted technicians can help design and install the right deck for your home. When you choose Chesley Fence & Deck as your deck builder, you will be provided with many different decking options, all made of the highest quality materials. 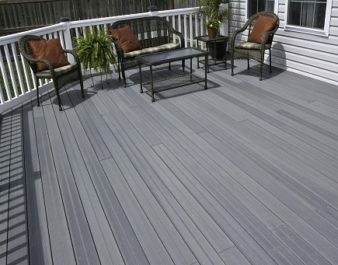 We offer Fairview Heights, IL, residents both composite and wood decking options. For wood decking, we offer treated lumber or premium cedar. Our treated lumber is both cost effective and can be stained and sealed while our premium cedar boasts superior durability and a natural warm look. Tamko EverGrain® Envision® PVC coated composite, which is our top-of-the-line decking that has all the benefits of our Tamko EverGrain® decking in addition to superior durability and is mold and mildew resistant. As a premier deck builder, we also offer some of the best warranties in the area. We provide a three-year labor on our installation and pass along outstanding manufacturer warranties on our products, such as a 20-year warranty covering deterioration on our Tamko EverGrain® Envision® PVC coated composite decking. To learn more about Chesley Fence & Deck, the deck builder chosen most by homeowners in and around Fairview Heights, IL, contact us today.